With the help of many contributors of the web site, here is a list of comics or collections that have been suggested for NEW READERS, RETURNING READERS, or LONG-TIME READERS of Daredevil. Many thanks to train, Pete, Greg, Clayton Blind Love, Jim B., Keith, rgj, CAS, Farwell3d, Jake, Mike Without Fear, Allison, awlrite4now, SeanWLuck, bry and alfiemoon! For more details on any of the comics listed, be sure to visit the TRADE PAPERBACKS, HARDCOVERS, VOLUME 1, VOLUME 2, VOLUME 3 and VOLUME 4 sections of the site! Let's say you've never read anything, or are here because you liked the movie! The classic Daredevil origin story by Frank Miller and John Romita, Jr. Many elements of this comic are used in the Netflix Daredevil show. This series by Jeph Loeb and Tim Sale is a look back at the days DD wore his yellow costume. It weaves its way around the original Stan Lee origin story from 1964. Considered to be one of the best graphic novels of all time, this tale by Frank Miller and David Mazzucchelli is a must-read. The Kingpin learns that Matt Murdock is Daredevil... and he shows him that a man without hope is a man without fear. Essentially if you have heard good things about the Bendis/Maleev run, or the Brubaker/Lark run, you are in luck, because all of these issues have been collected. In fact, only #20-25 of Volume 2 has not been collected in Volume 2! Please visit the TRADE PAPERBACKS section and the HARDCOVERS section for more info! If you are here because you've heard good things about Andy Diggle's run, it starts with issue 501, and you should pick up Dark Reign: The List - Daredevil #1. If you are here because you've heard good things about Mark Waid's run, you can start with VOLUME 3, which are available in single issues and collections. As always, if you've got questions, please send me an e-mail! Let's say you have read Daredevil in the past and want to catch up on what you've missed. Let's say you've read Daredevil for a while, but you've missed a few gems. #-1 one of the best Joe Kelly issues with Gene Colan to boot! #53-71 Roy Thomas and Gene Colan hit their stride. #113-115 Gerber, Man Thing, Death Stalker and the late, great Bob Brown. #139 A Night In The Life - Street level DD years before Miller. #146 - The classic Bullseye/Daredevil fight in the TV station. (Milla recently mentioned this one in #48-vol.2!) You better have this by now. #148 Manhunt - Death Stalker again. Shooter/Kane. #196-200 Great issues with Bullseye and DD in Japan! #225-226 Here we see the beginning of Matt's deterioration before Born Again, his partnership with Foggy, his love life, his mind. This is the beginning of his descent, these 2 issues still grab me to this day. #236 The first Ann Nocenti issue with the great artwork of Barry Windsor Smith. We see the fallout after Nuke's attack on Hell's Kitchen. A very under-rated issue. #266 "A beer with the devil" one of Ann Nocenti's best showing more of her great knack for telling stories about morality. Mephisto taunts DD! #267-268 Some more great stories with Ann's take on morality. DD at one of the lower points of his life in these issues. #278-282 Daredevil goes to hell to face Mephisto. More great stuff by Ann Nocenti. Morality, politics, theology, she always had some message to get across in her stories, I think that's why I loved them so much. #284-291 The wrap up to Ann's run, DD loses his memory, Bullseye becomes DD, Matt becomes a boxer like his Dad, DD and Bullseye have a fantastic battle and Matt reunties with Foggy again. I love these issues. Welcome back! Surely, you know that Daredevil has been relaunched now. What? No? Okay, pick up Guardian Devil and start reading all the trades of the Vol.2 Daredevil series available. Read my favorite of the current series, Parts of a Hole! Then dive into the brilliant trade called Wake Up. Did you know that this is Bendis' first Marvel work? Yes, Ultimate Spider-Man was printed first, but this Daredevil tale was in the drawer complete first. Now have a blast reading these Bendis trades! Now you must own either the Essential Daredevil or the Marvel Masterworks (Vol.1 & 2). By now you have either been reading Daredevil for a very long time or you love this character so much that it is time to taste the Stan Lee stuff! You must love comics and this character, in particular, that you are ready to swallow "60's dialogue." No way would I suggest this to a new reader. An appreciation of comics and this character are in order first. #53 - Some might shoot me for this, but I love this way better than the original one. Gene Colan pencils an origin re-told story! A great alternative than spending the big bucks to get issue 1. It is not a couple of pages of origin story, no sir! It is all here! There are lots more of course, but I would say that #53 thru to 71 or so are key gems that are often over looked! Here's my list of the essentials, in the order they should be read. The list is intended for the new DD fan, but if you're a more experienced reader who's missed some things, definitely check it out, too. 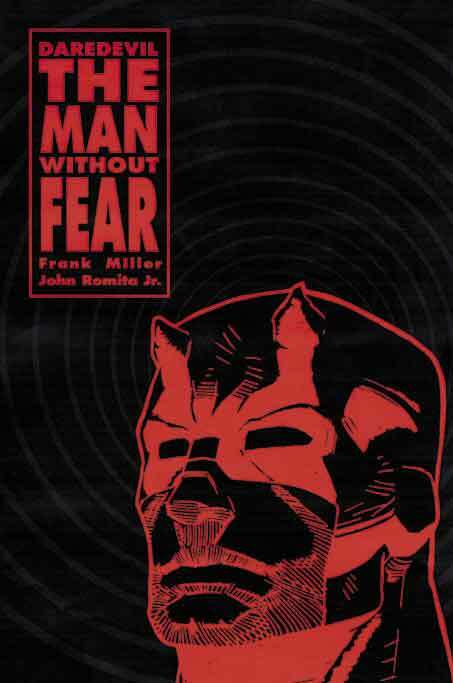 DAREDEVIL: THE MAN WITHOUT FEAR - trade paperback by Frank Miller and John Romita, Jr. DAREDEVIL: THE MAN WITHOUT FEAR by Miller and Romita, Jr. is the definitive origin of Daredevil. I absolutely swear by it. While Daredevil's origin has been retold a number of times, this retelling shows what shaped Matt Murdock into the vigilante he is now, in a way that stands apart from any other. It also has appearances by major characters that appear later in the mythos. And this story is by Frank Miller, the man who's written the best DD stories ever, and John Romita, Jr. is one of the best DD artists. The trade paperback hasn't been reprinted recently, but you can probably get a copy after some digging. You can try Amazon, where I got a copy, and I saw some at my local Barnes and Noble once. In addition, check out this invaluable resource: http://www.the-master-list.com/ EVERY comics retailer is listed here. DAREDEVIL 63 isn't as necessary as the others. I just wanted an issue featuring Karen Page that's somewhat memorable and preceded Born Again, in which she figures heavily. While Born Again eventually gives you all you need to know about Karen, I thought it would still be nice to see such an important character at least once before reading Born Again. A number of pre-Miller Karen Page issues would fit the bill just as well as Daredevil 63. You can find lots of the early DD/Karen Page stories reprinted in the Marvel Masterworks line and Essential Daredevil trade paperback, or just pick up DD 63 in less-than-mint condition like I did. I don.t have much of a liking for those early Stan Lee issues, though. Stan Lee.s great on other titles, such as Spider-Man and Fantastic Four, but DD is handled far better in other hands. While Miller's writing is the focus of this list, including DAREDEVIL VISIONARIES: FRANK MILLER VOLUME 1 is still very necessary, even if he's only credited as a penciler, or penciler/co-plotter at most. Miller and inker Klaus Janson grew as an art-team-supreme in these issues and Daredevil fights an array of opponents. Plus, the storyline with the Hulk and Ben Urich's investigation of DD's identity sets up DD's relationship with Ben Urich for stories to come. And Miller's collaboration with writer Roger McKenzie was clearly an early influence on Miller's own writing. DAREDEVIL VISIONARIES: FRANK MILLER VOLUME 2: If there's one book that's the core of Miller and Janson.s run and everything great about Daredevil, this book is it. It features Elektra's first appearance, her struggle with the Hand, her confrontation with DD, a close look at the homicidal nature of Bullseye, DD's moral ambivalence, the Kingpin's operatic grab for power.and DD 181. Miller began his comics writing in spectacular fashion. DAREDEVIL VISIONARIES: FRANK MILLER VOLUME 3 caps off Miller and Janson's collaboration on the title, which is enough reason in itself to get it. Other reasons to buy it: seeing just how much Elektra means to DD, how Kingpin defines his and DD's relationship, and DD paying Bullseye a visit.an unremittingly edgy story and one of the most insightful DD tales. ELEKTRA: ASSASSIN is the only book on the list that isn't placed chronologically, but its placement on the list is the best place to read it from an overall storytelling point. Can't really explain why without giving away too many details - just going to have to trust me on this. Also, there's been some difference of opinion as to where the story fits in continuity. For reasons best discussed between those who have read it, I consider it a prequel to the Elektra stories in Miller and Janson's run. Just don't expect Daredevil to appear in it. Matt Murdock may only have a two-panel-or-so flashback appearance, but to truly understand Matt and Elektra's relationship, you need to understand Elektra first. Elektra: Assassin helps towards that end. Additionally, Elektra: Assassin has a distinct visual and narrative sophistication and is a strong part of the next evolutionary stage in Miller's writing. Art by Bill Sienkiewicz. The miniseries has been reprinted a number of times, but the most recent reprint is the hardcover, Daredevil / Elektra: Love and War. It collects both Elektra: Assassin and the first DD graphic novel, Love and War. DAREDEVIL 219 is a stand-alone story. Even though it has nothing to do with Born Again, a certain aspect of how Matt Murdock is portrayed is something of a precursor to Born Again. Written by Miller, drawn by John Buscema. DAREDEVIL: LOVE AND WAR gives a revealing portrayal of Daredevil's greatest enemy, the Kingpin. This is Miller and Sienkiewicz's first collaboration. The original graphic novel printings don't have "Love and War" on the cover, just "Daredevil" as the title. How descriptive is that? "Love and War" is inside the book. Getting one of those printings is very hard, but Amazon helped me out some time ago. As stated above, it was recently reprinted in Daredevil / Elektra: Love and War. 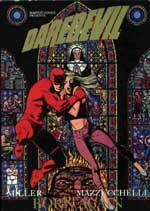 No Must-Read-DDs list would be complete without DAREDEVIL: BORN AGAIN. Daredevil has long opposed the Kingpin, and now pays dearly for it. As with a number of books on this list, *every* comics collection should have this book. But to fully appreciate Born Again, you need to read the stories on this list before it. Born Again is the last listing here for the best of reasons. Not only does it chronologically take place after everything else, it.s a rare pinnacle of talent, story and art. And there has been no finer creative team than writer Frank Miller and artist David Mazzuchelli. Reprinted many times, the coloring shows up the best in the recent Marvel Legends edition. As a longtime comics reader of various series, these are the books that I re-read the most. Daredevil interests me like no other character, and these stories are the reason why. If you haven't read them, please do yourself a favor - and enjoy. I’m cobbling together a few Daredevil reads for you here that are somewhat off the beaten path. Every fan of Hornhead has read “Man Without Fear”, “Born Again”, and “Yellow”. What are some deeper cuts? With that as our guiding premise, here are a few recommendations. Daredevil Vol. 1, 7- If you want to see the measure of Daredevil’s bravery, there is no clearer example of him ‘punching above his weight’ than Issue 7. Hornhead vs Namor. And Wally wood shows off that new eventually iconic red suit! Daredevil Vol. 1 12-13 - Again, a deep cut. These two issues are drawn by some schlubs named Romita and Kirby, if you are a comics historian and they take Daredevil to the SAVAGE LAND! Daredevil Volume 1, 215 - A time-spanning team up between Daredevil and the Two Gun kid! WHAT IS THAT? Not a "what if", either! Daredevil Ninja TPB – This one just struck me, from expanding on some threads teased in the Netflix show. There is a bit more here on Stone and the Chaste, and the debut and origin of one of Marvel’s most powerful weapons. What’s the Hand’s deal? A lot of their M.O. is explained here. Daredevil Redemption TPB – If you want to see Matt Murdock at his legal eagle best, this is it. He’s outside NYC and just doing his thing. This features some haunting art, and an even more haunting story. Daredevil Reborn TPB – The spiritual successor to Redemption. DD is on sabbatical from the Kitchen, and another fascinating case finds him. Daredevil / Punisher 7th Circle TPB – If the relationship between Punisher and DD in the Netflix show garnered your interest, this collection should be your next stop. Their perspectives are laid out, and their similarities and differences are explored. Got your own comments, please send them to me and I'll post them!